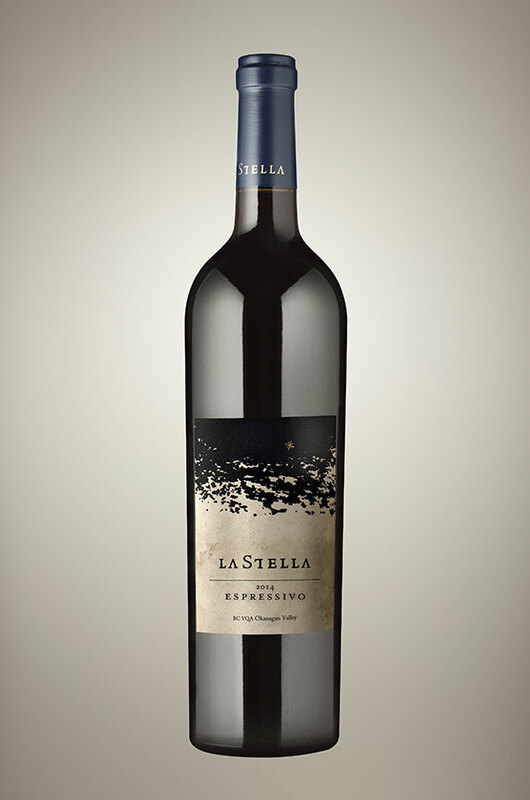 2014 marks the inaugural release of Espressivo – the newest member of the LaStella Family. A Tuscan-inspired red blend much like its sibling Fortissimo, except Espressivo, is Cabernet (Sauvignon and Franc) dominant while Fortissimo is Merlot dominant. 2014 Espressivo is as outstanding as we thought it would be during its upbringing in the barrel; all the components are married seamlessly together. The large format puncheons and Hungarian/Slavonian oak are evident in the subtle way the oak is present. The fruit profile is darker, married with savoury, herbaceous and spicy notes. The tannins are edgier and the wine is more expressive on the nose. We look forward to following the evolution of this wine in the bottle for years to come. Lovely savoury old-world stylings in this new “super tuscan meets BC” release from La Stella, A blend of cabernet franc, cabernet sauvignon, merlot and a splash (5 percent) santiovese. Restrained yet powerful, with stones, dusky cassis, textured with worn wood and firmly structured. Tannins are potent, but fine, and gritty with the intent to house the fruit. Impressive now, and will be more so with age. Un assemblage rouge, en grande partie, de cabernet franc ainsi que 20% cabernet sauvignon, 20% merlot et une trace de sangiovese. Style Bordelaise avec une très jolie structure tannique qui mérite encore quelques années de garde pour s’assouplir. Elegant avec notes de feuilles séchés ainsi que des fruits rouges and noir. Belle fraîcheur en bouche. Expressivo is a new (as yet unreleased and unpriced) blend that attempts to express Tuscany, with 5% sangiovese tucked in among 55% cab franc, 20% cab sauvignon and 20% merlot. And indeed it does capture the red currant, earthy and wild fresh herbs and sour edges of an Italian red quite nicely. It’s full bodied, elegant, quite richly textured, warm and powerful, trailing warm alcohol (14.5%), French and Slavonian oak is nicely embedded here with the latter providing a subtle cedary/woodsy ambiance, along with the effect of the dusty tannin. The length is excellent.